Morgenland has created the campaign for launching the Olympic Broadcasts as a streaming service. The integrated work for broadcaster MTG/Viasat and service Viaplay includes strategy, concept, Television spots, Digital Display, Radio, Print etc. For the first time ever in Swedish history the state channel is not responsible for the Olympic broadcasts. Commercial and competitive MTG acquired the rights to both the winter Olympics in Sochi and the Summer Olympics in Rio. 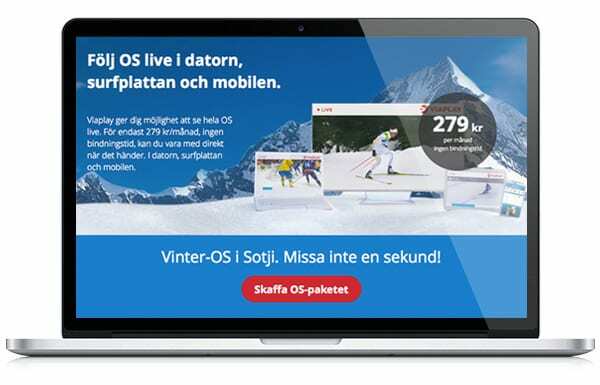 As the first commercial broadcaster in the Nordics to be responsive for the Olympic viewing experience; MTG has roiled out the events on both free-TV, pay-tv and digital channels. Nowhere is the offer as full and complete as on the digital platform, with Viaplay offering more than 1300 hours streaming at any time and any device. Morgenland were proud to be selected as the partner for the overall communication of this very special event. The concept for the campaign was “You can miss a lot – But not this.” and Morgenland created the communication platform. It included overall strategy and message hierarchy. Integrated in all kinds of Digital Display, Television Spots, Radio, Print, and Landing Pages for one of Viaplays largest campaigns ever. The Olympic campaign focuses on the user experience, and the everyday situations with different viewing devices that an Olympics broadcasted daytime will necessarily provide. And everything was screened and approved by The International Olympic Committee (IOK).